Metal maniacs, rejoice! I am proud to present to you: SKULL FIST; signed via Noise Art Records, hailing from Canadian grounds - performing Heavy/Speed Metal, on their 3rd album entitled: “Way Of The Road” (released October 26th, 2018). Since formation in 2006; the quintet in question have a Demo, an EP and 3 albums in their discography so far…I am introduced to their 3rd album entited: “Way Of The Road”. 9 tracks ranging at around 35:29; SKULL FIST arrange an intricately designed formula of hard-hitting Heavy/Speed Metal developments. “You Belong To Me” begins the record; conveying in extremely boistrous bounciness, amalgamated with constructively distinguished songwriting vehemence. The band dominate with elegant deadliness of heavily concrete grit; contrasted with a grandiose manifestation of meticulous melodies and relentlessly sonic rhythms that are amplified with adrenaline-fuelled flamboyancy, fabricated with a catchy aesthetic and groovy - hardened hymns for good measure…chugging and galloping with chaotic mayhem in mind. Consisting of Zach Slaughter on vocals/guitar; the frontman demonstrates high-pitched pipes of profusely robust ramifications, distributing distinct harmonies in the rushing “No More Running” which wildly and seamlessly injects an infectious systematic of speedy stampedes that rampage with blisteringly thunderous results. Johny Nesta on guitar also attributes complex dexterity in the crunchy “I Am A Slave; efficiently establishing inventively creative detail with diversely dynamic variety. Audible bassist Casey Guest converges consistently frockling finesse; assaulting with captivating hooks and grabbing efficaciousness, excelled with progressively technical salubriousness that thumps with solid versatility while utilizing skillful speediness… profound in the proficiently savage “Witch Hunt”. The titular track onslaughts with battering drumming from JJ Tartaglia, hammering with hasty pummelling in which unleashes ultimately wrecking supremacy. “Heart Of Rio” elements with primitively malicious implementations, while showcasing uniquely unprecedented specialities. “Better Late Than Never” experiments with more thrashy portrayal; still rapidly swifting with a razor-sharp nimbleness, and a borderline foundation of fluidly polished songwriting and sound production stability. “Don’t Cross Me” forges with forceful velocity, pounding with meaty steel and weighted heaviness in which explodes with ear-tingling madness. 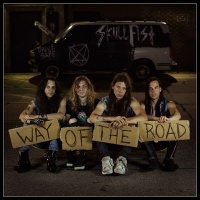 Overall concluding “Way Of The Road” with the finale track: “Stay True”; I can confidently say that SKULL FIST certainly outdone themselves here, a great discovery for all thrashing maniacs!